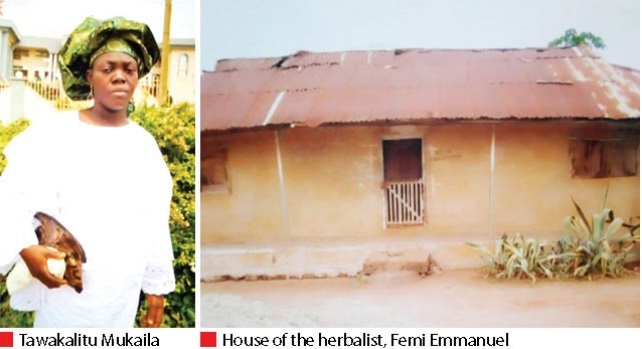 A herbalist, Femi Emmanuel, has been arrested by the police in Kwara State for allegedly causing the death of a 45-year-old woman and a mother of two, Mrs Tawakalitu Mukaila, in his house, according to a report by DailyTrust. It was gathered that the death occurred in Emmanuel’s house at Ila-Odo-owa, Oke-Ero LGA, after Tawakalitu, a trader and resident of Ago-Oru Area of Omu-Aran, was earlier accosted by Emmanuel while hawking rice and beans at Omu-Aran market. Emmanuel was said to have told Tawakalitu that she and her family were under spiritual spell and attack and needed urgent exorcism. He was noted to have narrated with precision, some past negative incidents in Tawakalitu’s family at Isale-Oyo in Oyo State. Her husband, Mukaila, a driver who hails from Oke-Ode in Kwara, had been involved in a ghastly motor accident about four years ago which incapacitated him and made the use of both legs impossible except with crutches. It was gathered that after constant pressure and allegedly aided by a charm, Emmanuel met the deceased at the market on Thursday, March 21, in Omu-Aran and lured her to his house in Ila-Odo-owa. Tawakalitu was said to have immediately left her wares and headed for Emmanuel’s place along with her 17-year-old niece, Azeezat, an SS1 student. Mukaila, the husband, said: “ Tawa told me about what one Emmanuel, a spiritualist, told her while hawking at Omu-Aran market and I told her to ignore such antics from the said spiritualist. “But after that my wife always complained about pressures from the same Emmanuel and I could not stop her from doing her legitimate business which she had been using to feed us, more so as I’m not that fit. He said on Sunday morning, Azeezat suddenly re-appeared, looking pale and exhausted and narrated to them what transpired between his wife and Emmanuel at Ila-Odo-owa. “Azeezat told us that she and Tawakalitu slept in the house of the spiritualist on Thursday and Friday and on Saturday morning he gave Tawakalitu a concoction to drink with pap. “She said after drinking the concoction Emmanuel gave her (Tawakalitu) a bowl where she vomited some liquid portions which Emmanuel took away. Azeezat said after vomiting Tawakalitu became very weak, exhausted, unconscious and died a few minutes later. According to Mukaila, Azeezat said after she died, Emmanuel bundled her body inside a room, locked them together with a warning that she too would die in the same manner if she dared narrate what happened to anybody. Mukaila said Emmanuel, sensing danger after Azeezat’s escape, reported the death of Tawakalitu to the palace of the Olota of Odo-Owa, Oba Josuha Adimula, who in turn briefed the Olomu of Omu-Aran, Oba Abduraheem Adeoti. He said after due consultation between the two monarchs the case was reported to the Iloffa police station in Oke-Ero LGA and Emmanuel was promptly arrested. The Divisional Police Officer in Iloffa was not around when contacted to inquire about the incident but a senior police officer who preferred anonymity, confirmed the incident. He said the case file with the suspect, the body of the victim and her niece had been transferred to the police headquarters in Ilorin for further investigation. The source said it took the intervention of policemen to prevent Emmanuel from being lynched by an irate mob that had gathered at his house during his arrest.